Regional report card partnerships are one of a number of foundation programs and activities under the Reef 2050 Long-Term Sustainability Plan. They bring together government and local communities including Traditional Owners, industry, farmers and fishers, scientists, tourism operators and volunteer community groups. Each partnership produces an annual report card that outlines the condition of waterways in their region. There are five Regional Report Card Partnerships. The Wet Tropics Healthy Waterways Partnership, formed in 2015, involves industry, community organisations, research institutions and all levels of government. The Partnership’s objectives are to coordinate the sharing of data, prioritise management actions and communicate (knowledge and results) to the broader community. The report card covers nine freshwater basins from the Daintree to the Herbert, eight estuaries and the adjacent marine environment extending to the eastern boundary of the Great Barrier Reef Marine Park. The Dry Tropics Partnership for Healthy Waters, formed in 2018, is a collaboration involving community, industry, science, and government – partnering to improve the values of the catchments and Reef. The partnership’s pilot report card is due to be released in May 2019 with information about three catchments (Black, Ross and Bohle), along with the immediate estuarine and marine environments, the Port of Townsville and Magnetic Island. This partnership is unique, as it currently focuses on the Townsville urban area, the largest urban centre in the Great Barrier Reef catchments. The Mackay-Whitsunday Healthy Rivers to Reef Partnership, formed in 2014, involves partners from community, Traditional Owners, industry, science, tourism and government working together to determine how and where more can be done to look after local waterways. The report card covers the geographic area of the Don, O’Connell, Proserpine, Pioneer and Plane basins; the urban area of Mackay; the ports of Abbot Point, Mackay and Hay Point; marinas; and the coastal marine area. The Fitzroy Partnership for River Health, formed in 2012, is a collective of agriculture, resources, industry, government, research and community interests across the Fitzroy Basin. Partners have a common goal of providing a more complete picture on river health and support this goal by providing funding, resources and contributing water quality and ecosystem health monitoring data through data-sharing arrangements. The report card cover 11 catchments (Nogoa, Comet, Upper Dawson, Lower Dawson, Theresa, Mackenzie, Upper Isaac, Lower Isaac, Callide, Fitzroy, Connors) and the Fitzroy estuary. The Gladstone Healthy Harbour Partnership, formed in 2013, includes community members, traditional owners, industry, science, government and harbour management. The report card is an independent report that assesses the environmental health of Gladstone Harbour and the social, cultural and economic health of the Gladstone local government area. The Wet Tropics, Dry Tropics and Mackay-Whitsunday partnerships report on the condition of freshwater, estuarine, inshore marine and offshore marineecosystems. The Gladstone partnership reports on the condition of inshore waters of Gladstone Harbour and the Fitzroy partnership reports on the condition of freshwater basins and the Fitzroy River estuary. unify the community on waterway health. Most partnerships rely heavily on data from outside sources to inform their report cards although Gladstone does some of its own monitoring. Marine monitoring data presented in the regional report cards includes Marine Monitoring Program data used for the Great Barrier Reef Report Card, but is supplement by locally-relevant data collected by port authorities and the Australian Institute of Marine Science. 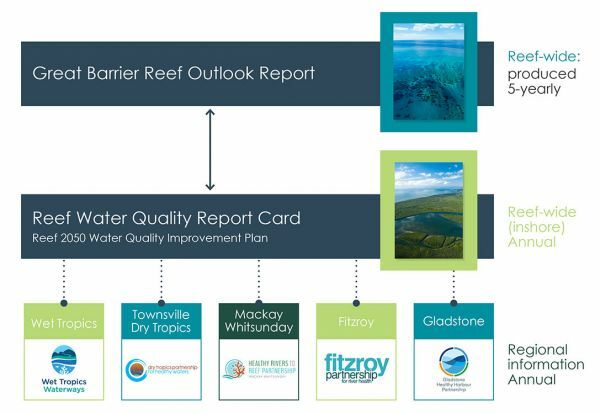 In this respect, regional report cards are nested within the broader monitoring and reporting program for the Great Barrier Reef.